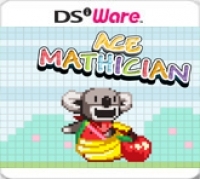 Box Text: You play as a cute Koala named Ace who loves fruit! Unfortunately a few delicious pieces of fruit are just out of reach and you need to change the positions of the platforms to get to the fruit! You can change the positions of the platform by entering a math formula. There's no right or wrong answer, every formula the player can come up with will have an effect on the world! Suddenly math becomes as fun as drawing! There are many possible ways to finish a level... be creative! Later levels will feature enemies and traps keeping the game challenging. And while your at it, you can collect stars for a better score! This is a list of VGCollect users who have Ace Mathician in their Collection. This is a list of VGCollect users who have Ace Mathician in their Sell List. This is a list of VGCollect users who have Ace Mathician in their Wish List.